In the month of August, we had showed how Uber is disrupting the taxi service paradigm in India, when we reported that a consortium of Meru Cabs, Easy Cabs and Mega Cabs have filed a case against Uber for allegedly ‘violating foreign exchange rules’. It seems that Meru Cab has understood the fast changing dynamics of taxi industry pretty quickly, as they have embraced technology, and introduced cash-free travel option via it’s new mobile application. Meru has teamed up with Citrus Pay to launch this cash-free travel wherein the users will simply have to upload cash into their mobile wallet. While travelling, the application will track the GPS locations of your travel, and accordingly the service charges would be deducted from the wallet without even clicking a single button. Step 3: If your GPS is on, the app will note down your starting point, and calculate the total distance covered. Additionally, the app will track the live positioning of the cab, suggest best routes and inform the estimated time travel. Other cab providers are also in talk with Citrus Pay to embed this mechanism in their systems, to make the whole process simpler and transparent. 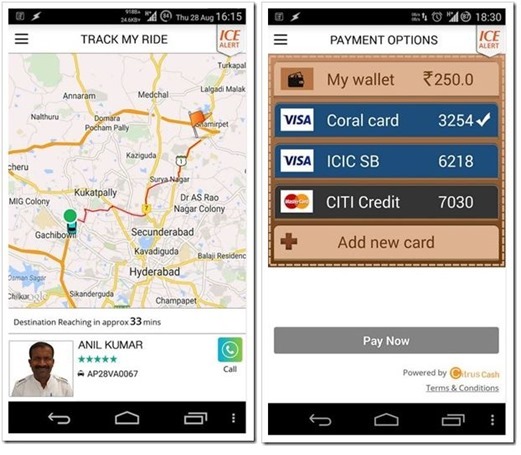 Ola Cabs, which is considered another biggie in this niche Indian taxi industry, has also introduced their cash-less travel mechanism recently, wherein customers need not look out for cash after the travel, and can simply pay using their mobile app. A great initiative indeed, powered by technology and a vision to make the taxi service industry robust and performance-oriented. Do share your opinion on this development: Will it help Meru Cabs to gain more market share? Or Indian traveler still prefers the old way of making taxi payments? "Now, Meru Cabs Too Introduces Cashless Travel", 5 out of 5 based on 1 ratings.